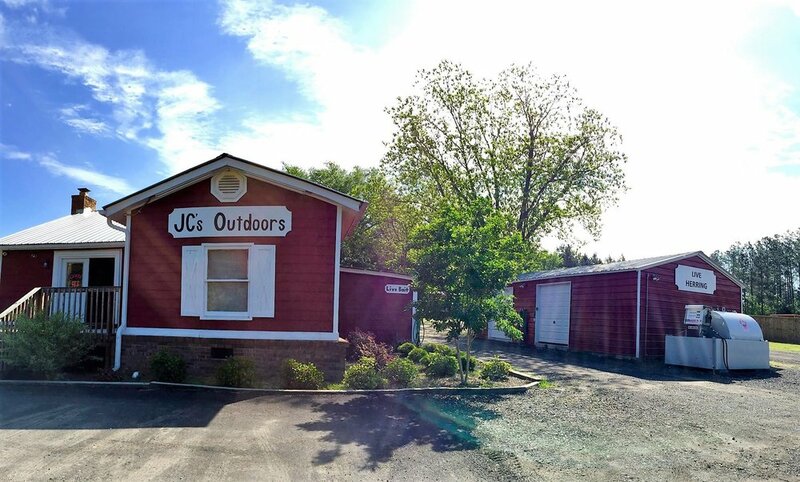 JC's Outdoors is a family owned and operated store to provide all your fishing, hunting and boating needs. We carry all the tackle you will need on any fresh water fishing excursion. Yes, we have LIVE BAIT! -Herring, minnows, worms and crickets. We carry all your hunting needs as well, including guns and ammo. We recently hired our new manager, Kirk Allen, who is a skilled bow tech and has brought many top bow lines into the store. We carry PSE, Bear, Diamond, and many more brands. We have brands like Yeti, Costa Sunglasses, Under Armour, Glock, Banded, Drake, Bubba Blade, Aftco, RTIC, Avery, Ozonics, Lew's, Calcutta, Local Boy Outfitters, Phantom, Benelli, Stoeger, Live Target and more! We are excited about the opportunity we will have to meet the needs of our community and fellowship with our friends and neighbors. NOW OPEN 7 DAYS A WEEK!!!! JC’s was started by owners, Chris and Jo Ann Veronee because of their love for the outdoors and their passion to reach their community for the sake of the gospel. They are followers of Jesus and hope to spread light in their community through their business. As avid hunters and skilled fisherman, their knowledge, combined with their work ethic, has kept their business going for 5 years now. They have plans to build a brand new store on the existing property by the end of the next year. They have over 100 brands in the store now and have simply outgrown their small, quaint store. The new store will be over 10,000 sqft and will offer a full size kitchen, archery range, and boat storage. Please help in supporting JC’s by shopping local. We appreciate your business!